If HTC J Butterfly was the most discussed name among techies a day ago being the first handset with 5 inch 1920x1080 pixels display, the Oppo Find 5 too came out have a direct competition with the HTC device. The Oppo Find 5 which comes in a much thinner size will be a strong contender for Galaxy Note 2, Spice Stellar Horizon Mi-500 and few others too. But what makes the news is its thickness which comes down to merely 6.9 inch. The initial reports say that Oppo Find 5 will be available only in China and no wording about an international launch. This smartphone would be a blessing for those who were waiting for a device with large screen size. So now it's much sure that the Oppo Find 5 and HTC J Butterfly would have a face to face fight to reach the minds of the tech enthusiasts. While the HTC J Butterfly will reach the shores of Japan early in November, the Oppo find 5 would make its way only in December. A 5 inch display is being spotted on both smartphones. The HTC J Butterfly does boost to have a Super LCD3 HD 440ppi display while the Oppo Find 5 would make a comfortable entry with a whopping 441ppi display. The Oppo Find 5 is packed with a brand new Snapdragon S4 Pro 1.5GHz quad core processor which would give results in a fraction of second. While the HTC J Butterfly also do come with the power packed Snapdragon S4 Pro 1.5GHz quad core processor which boost to be the life the smartphone. The major highlight of both smartphones would be the 2GB of RAM and 16GB internal memory which does come along with a microSD support. The HTC J Butterfly is bundled with a 8 Mega Pixel camera while the Oppo Find 5 fans have something to enthrall as this smartphone is packed with a 12 megapixel camera. But HTC smartphones have already proved their mettle and already is tagged along with top rated cameras which could take incredible snaps. The Oppo Find 5 makers do have to work a little bit to improve their contribution in imagery technology. The HTC J Butterfly boosts of having the HTC Image Sense which is possible of taking your dream photos and video at its best quality. So the HTC J Butterfly would have an edge forward with its remarkable camera features. 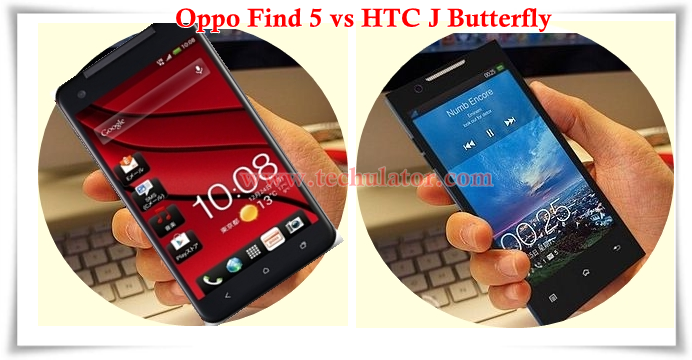 While making the comparison of battery power between the two smartphones HTC J Butterfly fails a little bit to Oppo Find 5. The HTC J Butterfly does have a 2020mAh battery while the Oppp Find 5 takes an advantage over J Butterfly with a 2500mAh battery. Both smartphones are powered with the latest Android Operating System, 4.1 Jelly Bean which would give an extra power while browsing internet. Touted as the world's thinnest 5 inch smartphone, the Oppo Find 5 which is less than 7mm defeated its arch rival HTC J Butterfly with 9.1 mm. The most achieving factor which HTC J Butterfly only can boost on would be the durability. The J Butterfly comes along tagged as 'WATERPROOF' which it only can be credited. So still another waterproof smartphone arrives in the market, HTC Butterfly would be the sole leader. The HTC J Butterfly would be preferable for those who wish to have a smartphone with stunning features. The Oppo Find 5 on the other hand needs to go a long to establish their caliber in the market. As there are no words about the pricing about both smartphones, we have to wait for more updates which will be followed in the coming days. HTC J Butterfly HTL21 Phablet full specifications and features are given here. As the price of HTC J Butterfly HTL21 is not revealed we have to wait for the official announcement. Designed and developed by HTC, the Phablet was unveiled on 17th October 2012 by KDDI, a Japanese carrier. The HTC J Butterfly HTL21 would be the world’s first Phablet to feature a 1080 pixel display. HTC J Butterfly HTL21 was one of the most expected Phablet to be released in 2012. Read more to know about HTC Butterfly HTL21. Folks ! Take a quick look at the post to check out the comparison of HTC J Butterfly Vs Nokia Lumia 920. Scroll down to find out the verdict of the Techulator analysis.